May 20, 2010 | Chasin’ Gus’ Ghost is now available on DVD through Rediscover Music! 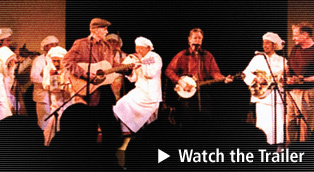 The live concert album Jug Band Extravaganza, featuring performers from the film, is also available! May 5, 2010 | Gus Cannon will receive a note on the Brass Note Walk of Fame on Beale Street in Memphis, TN on Friday, May 7th at 2:15pm. May 3, 2009 | “Chasin’ Gus’ Ghost” won the award for Best Music Documentary at the 2009 Bare Bones Film Festival in Muskogee, OK!